Many hours are usually spent deciding what color to paint a nursery. How much color? Should it be neutral? Too bright? Too dull? Color psychology is real and you want a room that’s perfect for your little one in every way. We get it, it’s tough. You want a room that’s visually appealing, but also optimal for the best sleep for your newborn. Before deciding on the cutest decor, ideal crib, and best mattress, think about your paint color. Paint sets the tone for the entire room and can affect your newborn more than you may think. Below are a popular color options for nurseries along with the psychology behind them to help you choose the right color for your special nursery. Ridge Painting Company has endless options and shades to match your desires during this incredible time of your life. This is usually the number one color choice for baby girls. Pink is romantic and loving. Light pink in particular is calming, which is goals for a nursery. Blue is a loved color by many, regardless of gender. Blue is healing, increases productivity, and is subtle. White is sweet, clean, and angelic. It’s best to stay away from all white in a nursery because it is definitely prone to stains! A white nursery is perfect for adding many pops of color to show emotion and personality. Gray is intuitive and emotional. 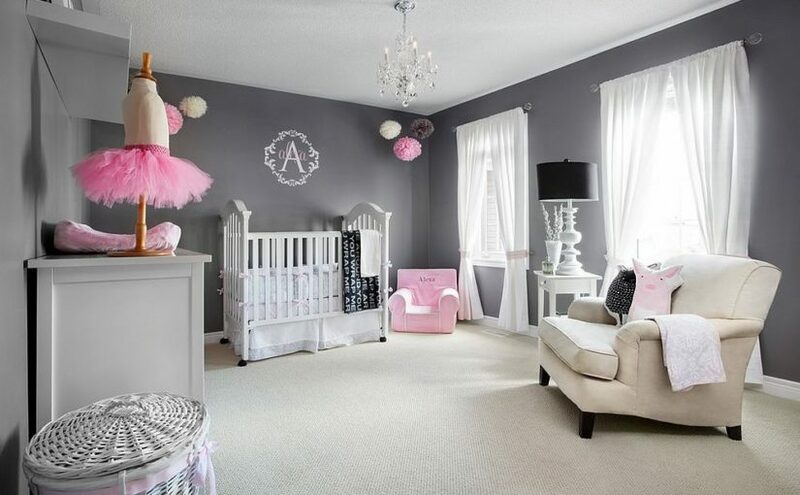 Gray has the tendency to promote sadness, which is the opposite of what you want in a nursery. If you want to use gray, use a warm tone and mix in some brighter colors. Yellow is happy, energetic, lively, and cheerful. Brightness is great for a nursery, but use yellow with caution. Subtle shades of yellow work best. You can’t go wrong with green – light or dark. It’s both calming and refreshing. It evokes learning and is serene. Green is a popular color option for any room in your home because of the emotions it provokes. There are endless options for your little one’s first room and it can be overwhelming, but it doesn’t have to be! Sleep is incredibly important for your newborns (and your!) overall health and wellbeing. Creating a perfect sleep oasis that is both in style and conducive to sleep is what we are here for. Enjoy every moment of this exciting time!